Indeed, our ISP switches to Ipv6 when available. It all makes sense. Glad you solved the issue! The server that hosts the X2Pro.net website also hosts the grupocmd one (it's a shared web-host). That server had a mistake in the configuration that, in some cases, caused the wrong website to be sent to a user. The mistake was that the two domain names were configured to use the same IPv6 address, which shouldn't have happened because every website should have unique a IPv6 address. I'm not sure, but I suspect that you were seeing it because (at some point) your connection to X2Pro.net was using IPv6. Working indeed! Well done. Just out of curiosity, how did you solve this ? Can you try the website/forum now? We think the problem may be solved. manoucho wrote: Ticket 4876: OK, I understand. It's strange because I remember shooting 24p, but indeed all material is 23.98. RED have said that this does sound like a bug and that they think they may have identified the issue and fixed it, so hopefully it will be in their new SDK which should be out very soon. When that happens we can use it in X2Pro, do some testing, and submit it to the app store for Apple's approval. We're probably some weeks off having a release that contains this, but we're making progress. Thanks for that info. 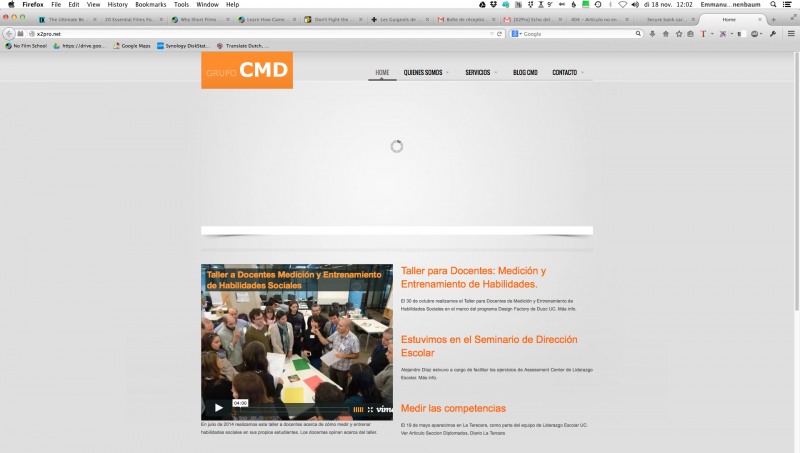 That website is grupocmd.com, a Chilean teaching organisation. I'll try Firefox and try connecting from the Netherlands and see if I can get it to happen for me then. Forgot to say I am in The Netherlands. OK I'll give it a try and worst case I'll accelerate the sound by 1% I guess. I'm not sure if 92ms would be a noticeable delay. It's about the equivalent of being 31m from the speaker. You should be able to tell by playing your project in FCP X.
www.x2pro.net doesn't redirect for me. I tried going to www.x2pro.net from a Spanish connection and it still wasn't redirected. Can you try from another computer and internet connection? What country are you in? OK. The film is consisting of several sequences of about 1min each. The longest is 92 seconds. So we're talking about a final delay of 92ms. Is it something you consider noticeable ? I've found out that it is impossible to detect from -90ms to +25ms. In my case it would be +90ms, am I correct ? Last Edit: 4 years 5 months ago by manoucho. I'm not 100% sure, but I think it's likely that the audio in your FCP X project will be slightly out of sync because the video is playing at 99.9% of the speed that the audio is playing at. Depending on how long your clips are will depend on how out of sync the audio will get. For each second of duration, the sync will slip 1ms. 1ms is probably inaudible, it's like the difference of being 33cm further away from the speaker, but if your clips are longer then the sync issue may be noticeable. Note that this is not a sync issue caused by X2Pro; it's because the RED clips are recorded at a different speed to what they have been described as internally. The editing is finished and in two weeks I'm going to travel to work with an experienced sound designer. I just wanted to double check with you that issue 4876 will not create a shift even of a few ms of the audio.